Last week I did my three mile flat out session on Tuesday as I mentioned in my last post, and some work in the gym afterwards. This week I did 15 mins at 13.8kph, then upped it by 0.2 every minute after, and ran the last 30 secs at 15kph. I covered 4.68km in 20 minutes. I need to cover 4.82km (3 miles), so I am near yet far. I worked out I have to run an average 14.5mph for 20 mins to get that target, so I am going to have to either just do that exactly, or start slower (like I am doing) and massively overcompensate in the later minutes. I think I am going to try the steady approach. I’ll run the first 15 mins at 14 or 14.2 next week and see how I get on. This has become a “must do now”. Overall that target is 6:40 minute miles average, which would be 12 seconds per mile faster than I ever remember doing it previously over 3 miles. I’d take that as a guarantee I’m fitter than ever before. On Wednesday and Thursday I completed two 7 mile road runs, deliberately doing a few miles less than planned because of the increased distance I would tackle on Saturday. I did my gym session on Thursday as planned too. Now that just left the ultra distance training session. It’s been probably 18 months (the Kalahari 2008) since I last tackled a distance over 40 miles. So, it would be fair to say there were a few nerves, a few worries, some nagging doubts. Could I still do it, I asked myself. It was a gamble. If I completed it, then I get the ultimate confidence booster going into the event; that I can tackle the long day distance that I will face in Chile. If I failed, for whatever reason, then it would just make the possibility of failure in Chile all the more real. It’s a mental strength thing. It’s unlikely in Chile that I’m going to get unlucky and get sick again, like last year, so really the success should lie in my own fitness. The problem is that it’s not just your physical fitness that is tested. These races are more about mental strength that anything else. It’s your own belief in yourself that you can succeed that is the difference between completing and not. Every day out there I am going to feel hot, short of oxygen and generally pretty rough. My mind will be screaming at me to throw in the towel. It’s a feeling that you get more used to, you push through and hopefully succeed. More of this later, back to the ultra training run. So, I carefully planned a 50 miles route that would take me to “a hill” that I can see on the horizon from a nearby hill to my home. I looked at local maps and determined that the hill was the one on which Beeston Castle, near Tarporley in Cheshire was atop. I planned my route to mostly avoid the road, using major footpaths, canal tow paths and lesser footpaths and fields where necessary. It would be a full moon, so hopefully there would be enough light for me to find my way as I would start out around 4am. I transferred the map and route onto my PDA, and charged an extra battery. I filled 2.5litres of electrolyte, tested it was flowing, packed plenty of warm clothes as it would be -3 to 0C all day. I weighed my pack 5.5kg – perfect. The kind of weight I would expect to be carrying on the long day in Chile. I went to bed early, slept quite well and got up at 3:45. I ate some breakfast, had some tea and got ready. By the time all of this was done, and I had taken my PDA off charge, having to reset it because it had hung, it was almost 4:30am when I started. It was dark, but clear, with the promised full moon providing some extra light. I didn’t need to look at my PDA for the first 8 miles, as I knew the way. I ran up the hill outside my house and then over the field to stand by the Wedgwood Monument, a needle monolith that marks the highest point near me, and one where in daylight I can spot my “hill”. Of course all I could see were streetlights in patches for 30 miles in every direction with darkness in between. I paused for a second, just a mile into the route, contemplating the 45+ miles ahead of me. Those worries crept in again as I kicked off down the hill and set on my way. I had deliberately chosen as flat a route as possible, again emulating much of the long day across the salt flats and plains of the Atacama basin. The route would only have around 2000ft of ascent and no serious hills to tackle, other that the one I had already climbed, and some steady inclines along the way. About 2 miles later I tried to take a drink from my camelback; nothing came through. What? I had checked the flow. I looked at the tube and felt it; it has hard, frozen solid in the sub zero temperatures. A problem this early on wasn’t a good omen I thought, especially not for someone worrying about their ability to complete the distance even in perfect conditions. I remembered watching a programme about Everest and the climbed had to keep the drinking tubes in their jackets, near their skin and body heat to ensure the tube did not freeze. I pushed the cold tube down inside my jacket, next to my chest and ran on. 10 minutes later it had thawed and I could drink again. I left the tube out, only for it to refreeze in minutes. It was obviously colder than I thought I put the tube back against my skin, and there it would stay in between sips. So, for the first 8 miles I ran over some fields, past a few farms, and then a long road. I knew where every stile was, every fence, it was all very familiar. Then I got to 7.7 miles, the limit of where I could remember the route from memory and took out my PDA, installed with Memory Map and GPS guided. My route was missing. The nice red line that I had drawn on the map had vanished. I quickly realised that when the PDA had hung it had not properly saved the route. It had been there, I had checked it, but it had been wiped when the PDA was reset even though the map itself remained. I was cursing that something could go wrong so early, yet too far away from home to do anything about. I would have to try and remember the route and draw it onto the map now. I had studied the route in some detail, so it took but a few minutes to redraw it. Crisis over and I continued, now using the PDA to navigate. I soon turned off the main road and into a field, it was waterlogged, so I soon got my feet wet. Next it was up over a footbridge over a train line and then which way? I had GPS but it was so dark that I could not see the stile in the next field. I had to run across and search around to find it. This was no good, it was costing me time. The same happened in the next field, and I ended up to my ankles in nasty silage in the darkness. My head torch did not give enough light that I could navigate across the fields. I knew right away that this was not going to be sustainable. I could not stumble way in the darkness, searching the hedges for the stiles until it got light, about 7:30am. I made my way across farmland, spooking a herd of cows who decided to stampede, luckily away from me. I emerged onto the main road, and looked at my map. There was no choice, I was going to have to use a road route, at least until it got light. It was going to be slightly shorter, and harder underfoot (I was in trail shoes) but this was the only option . The last 20 minutes had raised my slightly sensitive stress levels at the moment, and to be back on the road with all the streetlights and intermittent houses was comforting in a way. 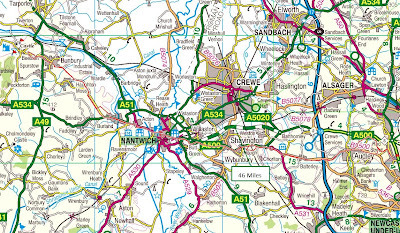 I ran along feeling better already, heading through Brough and Shavington near Crewe and then on towards Nantwich, eating up the miles and happy that I could still remember the LDS; the long distance shuffle - a running pace whith a backpack that doesn’t feel like you are running. It’s slow and sustainable, perhaps running at 5.5mph. I took this photo as it started to get a little lighter. Simultaneously ahead of my I glimpsed my “hill” for the first time, the dawn sun lighting it up; something quite poetic about that. I could now switch back to my original route, so straight away headed off the road and onto footpath. Here I took the photo I always take when I am in the desert, the 60ft shadow shot. With any luck I won’t be taking this shot in the long day of the Atacama, I will be in bed well before! Here another shot taken from the same place and time, back towards sunrise. I headed over the fields and then rejoined the road for a while before back over the fields to Bunbury. It was getting colder, there was a heavy frost on the already rock hard fields. I emerged from the fields into a small country lane on the outskirts of Bunbury to a light covering of snow, as pictured. So, I was almost there. I headed across the busy road and into the country lane which would take me towards the castle. I stopped and took this shot of the castle. Rather than continue on the road, I decided to head straight across the field towards it. I stopped about quarter of a mile short at a fence boundary and looked down at my watch. 24 miles done. It seemed like a sensible place to stop and return. I knew you had to pay to go to the top of Beeston Castle, and it was just reaching the hill I was always aiming for. It’s not a big hill or serious climb anyway. I took these two photos. Beeston Castle and then Peckforton Castle which is on the smaller opposite hill. I had been snacking on muesli bars as I had been running. I made sure I ate at least once an hour, even when I didn’t feel hungry. I had run every step of the way so far. I decided that I would walk back towards the main road, about ¾ of a mile away and take on a lot of food, to fuel me properly for the run back. I wasn’t tired, I felt good, but the brief walk would allow me to stock up and kick off for home at a good pace. I ate some crisps, another muesli bar and drank plenty of water. As soon as I got back to the main road again, I kicked off, ran back through Bunbury and back over the fields reversing my route. I ran along at my easy pace, just zoning out, eating up more miles, eating food as I went, just taking one shot as I crossed the Shropshire Union Canal. I didn’t stop running until I got to Nantwich again, having run 32 miles. I stopped in the same public toilets, in what was now a very busy town centre. I got more than a few strange looks as I made my way through the town centre. Annoyingly, my camelback clogged after I had just refilled it. I didn’t want to waste time with it, so I walked into a nearby petrol station and bought 2 bottles of Lucozade Sport (a litre), which I hoped would see me through the remaining 15 miles back. I drank one of these fairly quickly as I walked, clearing the town centre, then ran on again. By 38 miles I was starting to feel a little tired. All the hard ground was taking it’s toll on my knees and ankles. Where possible I would run on a grass verge, but that seemed to hurt just as much, and I would be glad to get back on hard ground. Seconds later I would wish for soft ground again, and so it continued as I headed back through Shavington and Brough. I got to the place that earlier I had realised my route had not been transferred onto my PDA. I knew I had 7.7 miles left. I took a conscious walking break of perhaps half a mile, walking up a gentle hill and then ran again. It was getting harder now and by 42 miles my legs were pretty heavy. It’s unfortunate that there it is all uphill from this point. I flipped between running and walking the hills. I walked the last steep hill on the road, and then ran the final less steep hill back up toward the Wedgewood Monument where I had stood in darkness that morning, worrying if I was capable of it. I was a mile from home, it was all downhill from here. I climbed up the steps to the monument a little triumphantly, hummed the Rocky theme tune but no crowd of cheering children appeared and touched the stone. I took towards the horizon and saw “the hill” 23 miles away. It’s the small dot, almost exactly dead centre. Today more than any other time ever, I felt like an Ultra athlete. I had run more than ever over this kind of distance. I walked a couple of times to eat and then on the hills towards the end. Apart from that I ran it with my backpack all the way. I stepped down from the monument, and got some sharp pain my right leg. I was worried about it for a few minutes, but it seems fine. I think it was my body relaxing, knowing that home was near. I ran the last mile down the hill to my house, feeling tired, a little rough, but happy. Final stats: 46 miles, 1900ft of ascent, 9hrs 40 minutes, 4.8mph average. No blisters, not even a hotspot, not a mark on my feet. I had worn a brand new pair of untested shoes, which should go against all advice (never try out new things on bif events! ); However, they are an updated model of the ones I wore in the Kalahari where my feet also stayed near perfect. I'll be using my New Balance 840's in Chile then. Here is the route I actually did, running right to left, and back. I was supposed to do the Anglezark Amble this weekend, but read that I was supposed to enter in advance. No online entry and no entry on the day. Maybe I could get a postal entry in, but it’s about 25 miles and it’s mostly boggy moorland and hills. Nothing like the Atacama terrain and now as the event approaches I start to worry about getting injured. Turning an ankle on rough moor. I’ve made a decision not to do it. The distance isn’t a challenge for me, so the event is more risk than benefit. I am going to visit my uncle and get some more chiropractic treatment at the weekend instead. I may do another 20 miler the weekend after instead. Physically I am ready... Mentally, I am struggling at the moment. For a lot of reasons; self doubt - I worry about the altitude, I worry about getting sick again, I worry about the temperature. Most of all I just worry that my mind will let me down. Convince me I am dying when I am not, and I throw in the towel and fail. Failing is the worst fear. The slightest problem on the event can set off self doubt, your morale goes and it’s the end of the world. Right now, the slightest problems here at home are causing me to worry. Recently parting ways with my girlfriend hasn’t helped matters at all, plus long weeks of work, too much travel and no rest at weekends, and bad sleep means that it feels like I never stop. I’m doing everything with my foot to the floor, and stress is having its effect. I know my fitness isn’t in question. I will doubtless be physically fitter than some others taking part. I am fit enough to tackle any distance in the Atacama, easily. All of this should be improving my mental strength, but it’s not right now. This isn’t the right attitude to be going the hardest race of my life with. I need to gain the single focus and will to succeed because it’s only my mind that will stop me out there, and the mind is far more powerful in these events than miles under the belt. I’m not sure what I can do to improve things right now. Nothing is going right. I’m trying to type with a burned hand, plastered in cream, which I just scalded with boiling water, trying to make myself a cup of soothing herbal tea to chill me out. I’d laugh at the irony of that under normal circumstances. Somehow I missed the cup and poured the fresh boiling water all over my hand. You have those days when things go wrong. At the moment, that’s every day. Stay positive mate. You've done the MDS. You've done all the training. You've inspired me a hundred times to keep going when I've been wavering - not going out because of the weather, or halfway round when I've been considering a short cut back. You are an unstoppable force. Rich, I think that these last minute doubts are perfectly normal and part of being human- I was a nervous wreck before MdS and was convinced I'd get ill or injured and not be able to go! Like Andrew said, you have done the MdS, you did the Augrabies and like you say there is very little chance you will get sick again. That was just pure bad luck. You are also used to getting out there, like Andrew said, and keeping going in adverse conditions and when things aren't going well. At least you have got to know the tricks your mind may play on you so you can be aware of them,which is to your advantage. I think you will certainly be a lot fitter and better prepared that a lot of other guys out there and I am looking forwards to reading your complete race report!